Our aim is to bridge the gap seen in many Primary Schools where a lack of confidence, musical knowledge or funding means that children can miss out on experiencing an exciting and enjoyable musical education. Our programme encourages teachers to sing in the classroom, set up choirs and provide them with ideas of how to produce beautiful singing in their own schools. 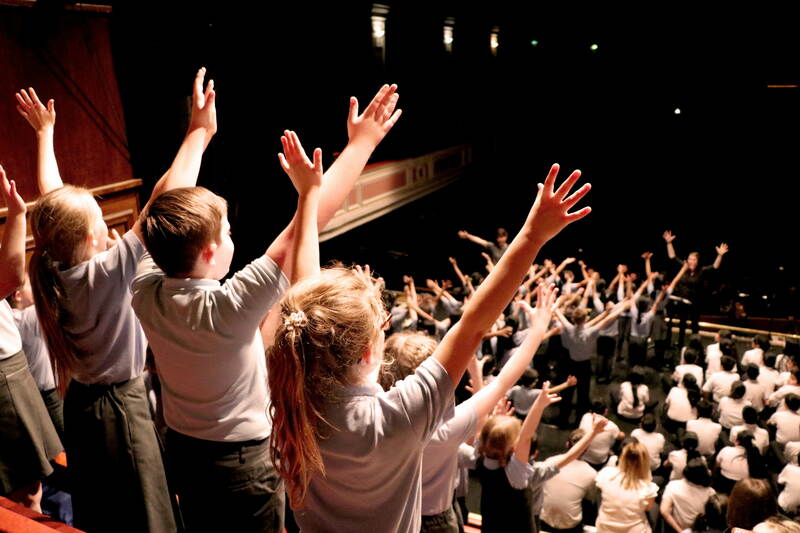 Founded in 2009, SingTogether reaches over 3500 primary school children and over 250 primary school teachers each year. Our annual, seven month outreach programme runs from mid September and culminates in March with a week of fantastic concerts at King George’s Hall, Blackburn. Each school takes part in one of these concerts along with 15/16 other Primary Schools per night, singing specially chosen group songs and performing for bewitched parents and teachers. In 2015/16 we had an audience of around 1000 for each night, on six consecutive days, creating such a fantastic atmosphere within the Hall. It is a project not to be missed! SingTogether is an annual seven month musical outreach project, which runs from September to March. We work with teachers and schools to provide a fun and engaging experience for the children and a confidence boost for teachers.